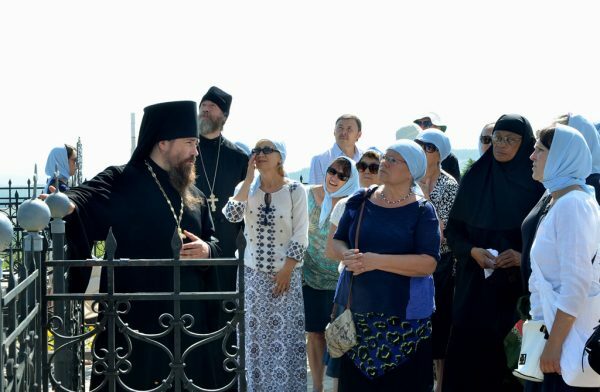 On July 26, 2016, the vessel “Alexander Suvorov” brought a group of American and Australian pilgrims led by His Eminence Metropolitan Hilarion of Eastern America and New York, First Hierarch of the Russian Orthodox Church Outside of Russia, to the Perm Diocese in Russia. His Eminence Metropolitan Mefody of Perm and Kungursk, ruling bishop of the Perm Metropoliate, greeted the important guest. “Your Eminence, dear Vladyka Hilarion, I am happy to welcome you to the land of Perm. We eagerly awaited your arrival. This morning, we accompanied the participants of our diocese’s annual St Seraphim Procession of the Cross in this very church. In a week, they will arrive in Belogorsky’s St Nicholas Monastery, which is also on your itinerary and where, God willing, you will also be in the coming hours. The land of Perm is special. Here, during the years of trouble, a great tragedy occurred here. The members of the Royal Family were murdered here in the Ural Mountains, here many clergymen and laypersons were martyred in the ensuing years of persecution of the Church of Christ. This spirit of resistance still abides over the land of Perm. 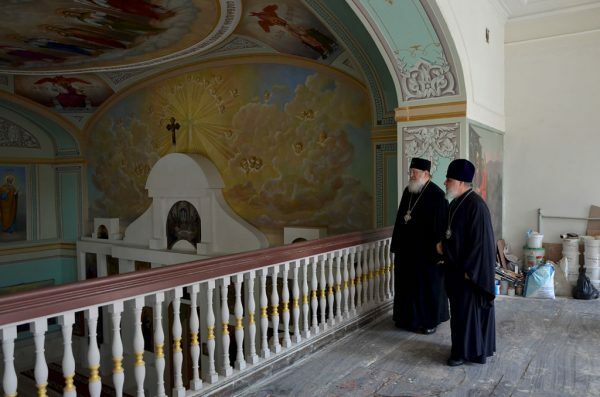 Why did we meet in this church, dedicated to St Mitrofan of Voronezh, in particular? This church is part of a complex of buildings of Holy Transfiguration Cathedral. It is the historic residence of the bishops of Perm. St John of Kronstadt served in this church. Here, Holy Grand Duchess Elizabeth prayed and partook of the Holy Gifts. All the important Church events of the Perm region originated from this temple. That is why I proposed that your pilgrimage to our region would begin from this church, which was infused with prayer for many years. The ruling bishop of Perm then gave Vladyka Hilarion a panaghia depicting St Stefan of Great Perm as a gift. Metropolitan Mefody gave him a book of the saints who illuminated the land of Perm with their asceticism, and each pilgrim also received souvenirs. 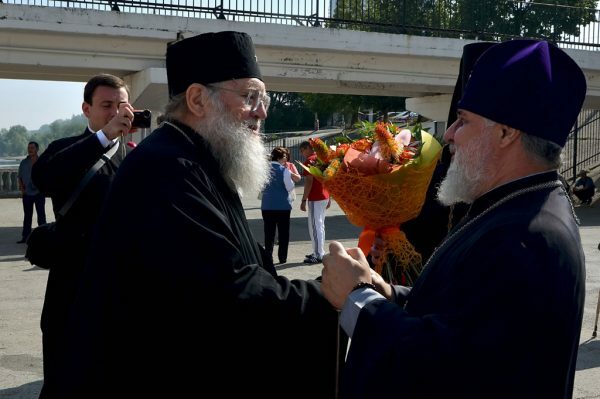 Metropolitan Hilarion thanked the head of the Perm Metropoliate for his hospitality. That evening, after touring the city of Perm, the pilgrims returned to their boat and departed for the city of Chaikovsky. 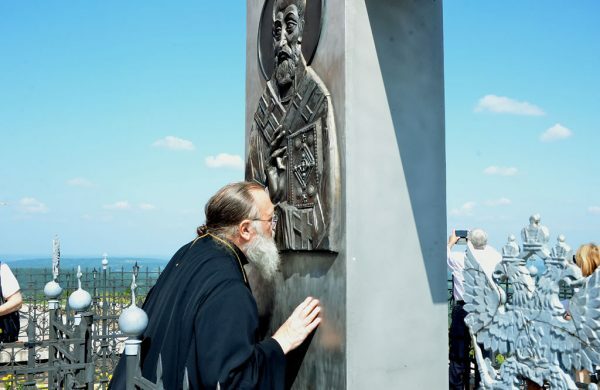 During their visit to Perm, Metropolitan Hilarion and the pilgrims visited Holy Trinity and SS Peter and Paul Cathedrals and Belogorsky St Nicholas Monastery.